The Eye Bank Society Of Rajasthan (EBSR) was formed as a Registered Society under the Rajasthan Cooperative Societies Act in Feb 2002 with the object of catalysing eye donation movement in Rajasthan. A group of enlightened citizens of Jaipur comprising of retired senior civil servants and socially dedicated individuals, including housewives, committed to the cause of eye donation came together to supplement Government efforts of corneal transplantation. EBSR continues to combat corneal blindness in Rajasthan in particular and in India in general so as to bridge the large mismatch between availability and demand for healthy corneas for the millions suffering from corneal blindness. The significant feature of this organisation has been shouldering the responsibility of counseling the families of the deceased by the members of the society in Government Hospital at Jaipur to donate their eyes . Today the organisation has the support of over 100 members at Jaipur and significant number in different chapters. A large number of well wishers are a source of our strength. The main functions of Eye Bank are, motivation, advocacy , collection ,preservation, evaluation and distribution of corneas as per standard prescribed procedures . All these tasks are performed by trained professionals maintaining highest quality standards .Only those tissues are distributed which are certified for grafting by the Medical Director ,an expert Ophthalmologist. The tissues are distributed first to Government Hospitals in Rajasthan , then to private Ophthalmologists in the state and thereafter available corneas are utilized through Centralised Distribution System (CDS ), controlled and managed by SightLife, for distribution to the surgeons in the country. 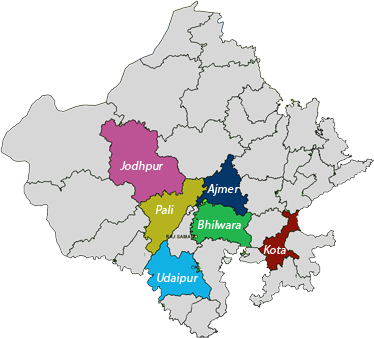 EBSR covers most parts of the State through network of its chapters at ,Ajmer, Udaipur, Jodhpur, Kota, Pali, and Bhilwara . These Chapters function under the guidance of the parent body at Jaipur. Their functions are to undertake awareness campaigns and collection of corneas. The corneas so collected are sent to Jaipur for evaluation and distribution so as to ensure uniform quality standards and timely utilization. EBSR is a non - government, non profit making organisation which depends for its sustenance on funds generated through public donations, Government grant/aid and monetary support from organizations active in Eye Care Sector world over.